What was once a run-down looking pub on the A610 has been transformed into a modern gastro pub specialising in season produce. The Nuthall promises to offer a select menu to satisfy any local food lover and with a friend working just across the road it works as a great place for a catch up after work. Especially with an early evening menu offering exceptional value if ordered before 6:30 pm. 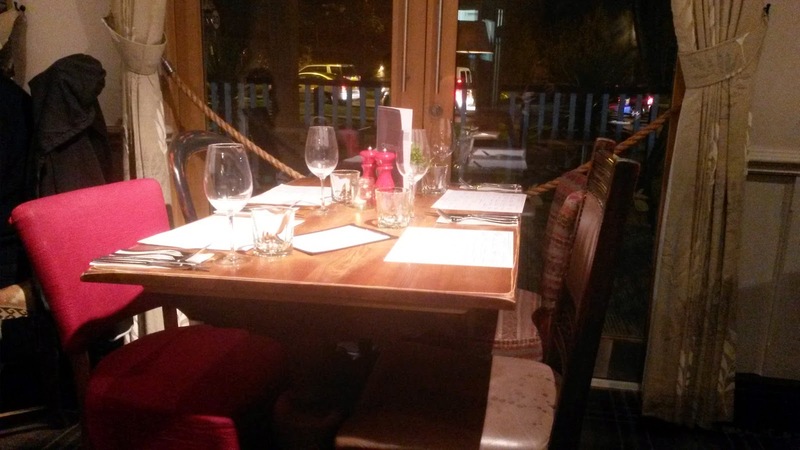 Whilst the main evening menu prices are a little on the premium side, the Nuthall offers a reasonably priced early evening menu with one course for £7.95, two for £10.95 and 3 for £13.95 which represents excellent value and makes the prices very comparable to many more budget establishments locally. Their early bird menu is available for orders up to 6:30 pm and at the time of writing featured a great varied range of options from starters of Pork, Chorizo and Apple Terrine, to Beef and Horseradish Croquettes. Mains including Battered Red Mullet Fillets, as well as Pork and Leek Sausages with Mashed Potatoes. The desserts include Lemon and Ginger Bakewell and a Honey Panna Cota. As you can imagine this is no basic low price menu. We both choose the potato cake as a starter. I have a new-found love of a poached egg despite the £2.99 microwave poacher I use for breakfast at work not quite giving the desired results one would hope for. On arrival at the table, apart from the servers lack of balance and rolling to the side of the plate, the eggs were perfectly poached. With a soft fluffy outer shell and a gloriously gooey centre. Our potato cakes were a lovely starter. A great size for a man's meal even if the giant Nuthall branded plate made it look on the smaller side than it actually was. Plenty of beef and a mild hint of horseradish with a mustard sauce and we were both very impressed. Beef and Horseradish Potato Cake with Poached Egg, Very nice although dwarfed by the plate size. 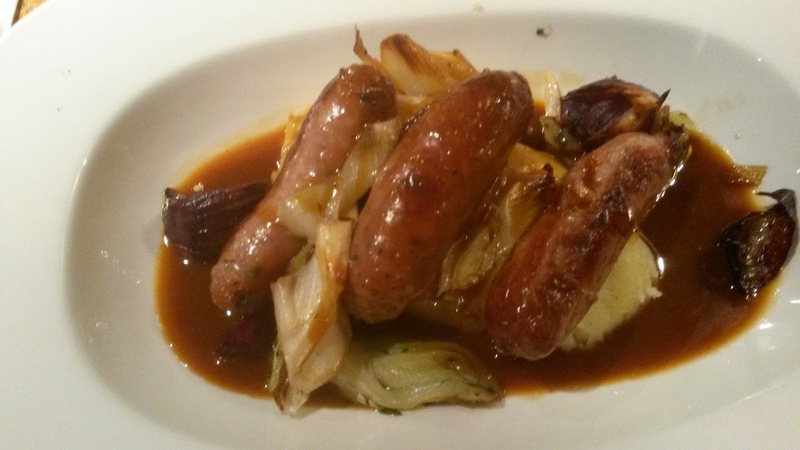 For our main meals we plumped for Pork and Leek Sausages which came out on a bed of colcannon mash looking like a great choice. The sausages were of a great size and the dish, whilst simple was very satisfying for the taster. I'd gone for the Mussels with Chorizo and hand-cut chips which sadly is now off the winter menu. 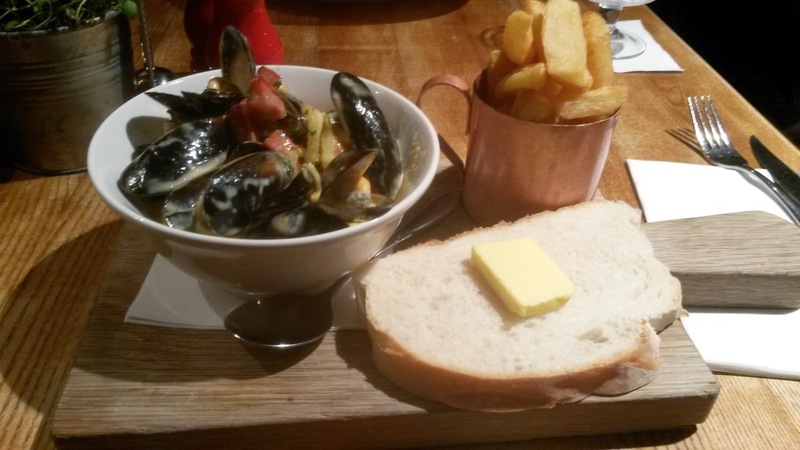 The dish came out looking fantastic on a wooden board with a big bowl of mussels and a nice sized mug of chunky chips. This was a cracking dish which I'd order time and time again if I had the choice. The mussels were lovely, all shells had opened and they had been cooked in a beautiful butter sauce which made a great dip for the fluffy, chunky chips and bread. I was really happy with this as my choice. 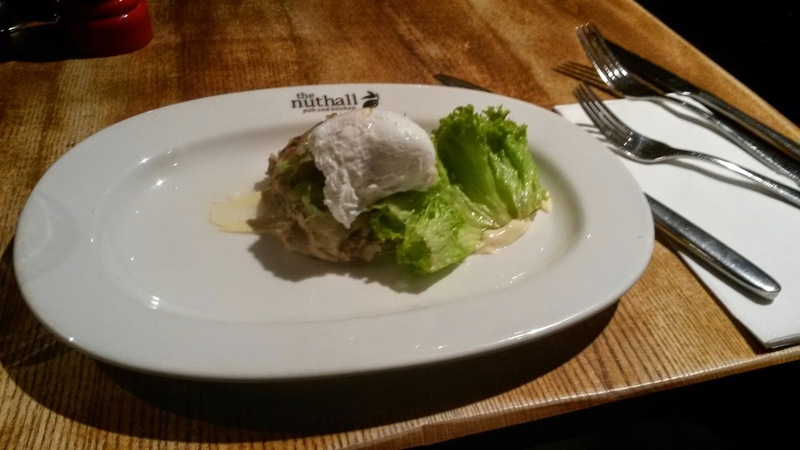 Would I go back to the Nuthall Pub and Kitchen? Definitely. Nice food with a twist and a fantastic menu which changes with the seasons means my love of trying new things can easily be indulged. I could easy meet my friend who works locally after work for a drink and food again very soon.